Here is a list of 5 free multipage TIFF creator to create multipage TIF images. These software take single paged TIFF and other images and then they merge them into a single multipage TIF image. The pages in the resultant image behaves as you are reading a book. Some of these software also let you order the pages of the final file. Not, only TIF images, some of these software also let you create a PDF file from TIFF images. TIFF or TIF is nothing but an image file format. It is an acronym for Tagged Image Format which is commonly used to store raster graphic images. TIFF images are widely used in photography and the interesting thing about them is that they can be merged into one another (as you often merge PDF files) to create a multipage PDF. To do that, you will need some software, and I have listed a few of them in the article below. IrfanView is quite a popular image viewer and converter with support of lot of image formats. But, so many people don’t know the fact about it that it is also a multipage TIFF creator to create multipage TIF images. Using IrfanView, you can easily create multipage TIF image from a set of single paged TIFF images. 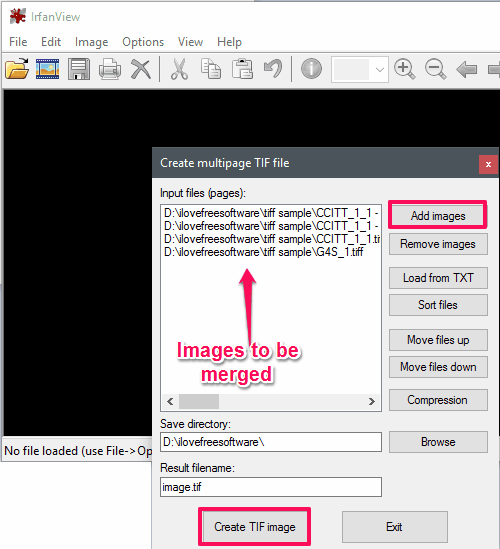 You can easily create multipage TIFF image from available TIF images. Follow these simple steps to do that. Step 1: Launch IrfanView after downloading and installing it from the above link. 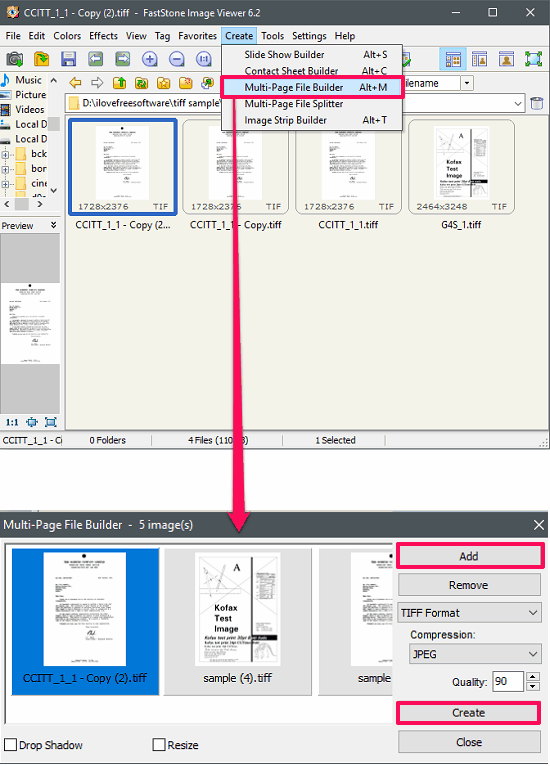 Step 2: Navigate to the Options > Multipage Images > Create Multipage TIF… menu. And after clicking on that you will see a dialog “Create multipage TIF file” will pop up. Click on Add images button to import some TIF files in it. Step 3: If you want to reorder files, then you can use the Move files up or Move files down to change the order. Also, if you want to compress the final multipage TIFF image, then you can also do that as it has a button for that. Step 4: When all the configuration has been done, simply start the merging process. Click Create TIF image button to start creating the multipage TIF file. After following the above steps, a multipage TIF image will be exported to the directory that you have specified. So, in this way you can easily create a multipage TIF file using IrfanView. I really liked the fact that IrfanView has provided an option to do that. Also, you can use some IrfanView plugins, to create multipage JPEG or PDF files. FastStone Image Viewer is another multipage TIFF creator to create multipage TIF images. It supports a large number of image file formats to view and do some basic editing operations. It is only free for personal and educational use. It can also play a musical slide show of the images with up to 150+ transitional effects. And it takes just a few clicks to create multipage TIF images using FastStone Image Viewer. Getting started with this image viewer is very simple. Launch it after downloading and installing it from the above link. After that, open it up and navigate to Create > Multi-Page-File Builder menu. After that dialog that will appear, import the TIF files that you want to merge using the Add button. After importing the files, simply hit the create button, to start the conversion process. Additionally, you can opt for various options such as resizing the images, final format of the files, etc., and also you can create an animated GIF from the selected files. So, in this way you can easily create a multi page TIF image from single paged TIFF images. Also, you can choose the final format of the merged file. If you are a home user and want to do the same, then FastStone Image Viewer is a very good option for you. reaConverter Lite is a feature rich batch image processing software that you can use to create a multipage TIFF image. It comes with a lot of features, one of which is manipulating Multipage image files. The interface of reaConverter Lite is very simple, you can easily import files in it and then easily convert them into multi paged files. To use reaConverter for merging TIF images, first download it from the above link, and then install it. When it has installed in your PC, simply launch it and add source TIF images in it using the +add files button. 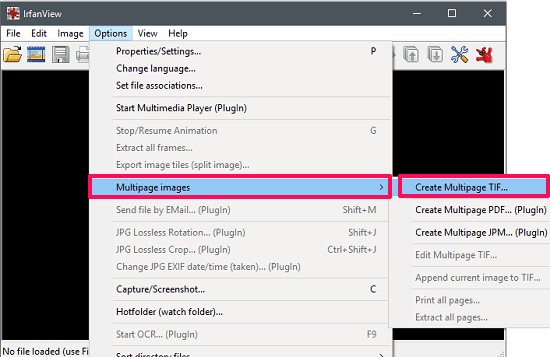 After importing your files in it, choose Multipage File option from the Menu drop down. And a window will pop up, where you will see some options. Check Save group of files to one file option, then hit the OK button and you will be returned to the home screen. Now, click on the Start button to start the merging process. When the process completes, you will see the converted files will be placed in the sub folder of the source folder. So, in this way, you can easily merge TIFF images to a multipage TIF file, using reaConverter Lite. I really like the software as it has all the necessary options in it to manipulate images of various formats. AppendTIFF is a free-personal multipage TIFF creator to create multipage TIF images. It is a very nice software as it is a dedicated software to merge TIF images. The software comes with a very simple interface and you can start creating a multipage TIF in it very easily. Additionally, you can opt to compress the final file that will be created. And the best part is you can order particular TIFF file between the conversion progress. However, it cannot extract TIFF images from a merged TIFF image. Getting started with AppendTIFF is pretty easy. Download and install it from the above link, after that open it up. Add some TIFF files in it using the Select Folder and files button. If you simply want to join the files, then hit the OK Continue button to start the conversion process. Then it will ask you to specify the output directory. And when you have specified the directory, the merged TIFF will be exported to that. So, in this way you can use AppendTIFF as a multipage TIFF creator to create multipage TIF image. I found it quite a nice software as it is only meant to do that. So, if you are looking for a simple and dedicated software to do the same, then AppendTIFF is a very good option. FaxTool is a very simple, dedicated, and lightweight multipage TIFF creator to create multipage TIF images. This tiny software doesn’t come with any other option other than merging or splitting TIF images. 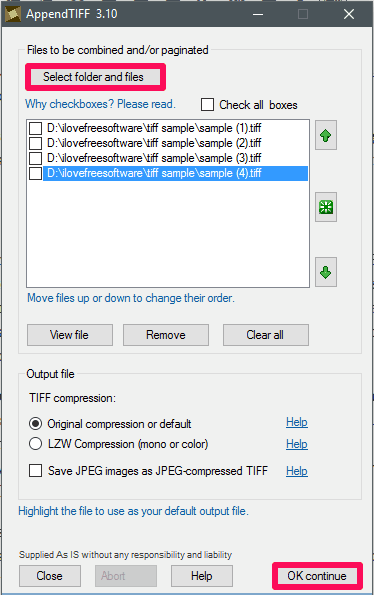 Once you have downloaded it on your PC, launch it and select multiple TIF images that you want to merge. After that, drag and drop the selected images on its interface and it will immediately ask you where to save the merged TIF image. And after specifying the target directory, merged TIF image will be exported there. So, in this way you can easily merge multiple TIF images to make a single multipage TIF image. Also, you can use the same process to split a multipage TIFF image. Just drop the multipage TIFF image on its interface. These were some pretty awesome multipage TIFF creator to create multipage TIF images. 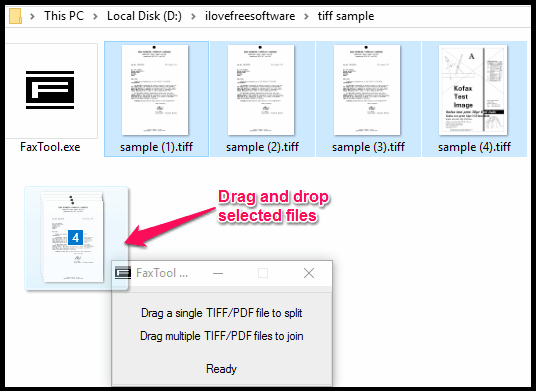 Using these free software, you can easily merge a group of files to make a single multipage TIFF file. Also, they come with certain other functions and features, that I have already mentioned in the context of each one of them. So, if you are looking for such software to do the same, then this list of software can come in handy.